With a population totaling around 260 million individuals, Indonesia is the fourth-largest country in terms of population size. Its ethnic composition is characterized by variety, in fact wide variety, as the country contains hundreds of different ethnic groups and cultures. However, more than half of the population can be classified as belonging to two main ethnic groups. This section zooms in on the people of Indonesia. These two groups are the Javanese (41 percent of the total population) and Sundanese (15 percent of the total population). Both groups originate from the island of Java, Indonesia's most populous island, which contains almost sixty percent of the country's total population. When the island of Sumatra is included, this figure rises to approximately eighty percent of Indonesia's total population, indicating a significant population concentration in the western part of the country. The most populous province is West Java (with more than 43 million people), while the least populous province is that of West Papua in the far eastern region of Indonesia (home to around 761,000 people). Indonesia's national motto "unity in diversity" (Bhinneka Tunggal Ika) reflects the multitude of ethnic, cultural and linguistic varieties that can be found within the boundaries of a nation state that is the world's largest archipelago. Indeed, when you imagine an animist Papuan (in the far east of Indonesia) meeting a Muslim from Aceh (in the far west) there are more differences - in terms of religion, clothes, lifestyle, tradition, native language, etc. - between both persons than there are similarities. This diverse cultural makeup of Indonesia is the result of a long process of colonization initiated by the Dutch. In a time-span of about three centuries this small European nation managed to (gradually) expand its political power in the Archipelago - conquering the various indigenous kingdoms - until the present-day boundaries were established. In other words, during the formation of the Dutch colonial territory in Southeast Asia all these diverse cultures became part of a single political power that was later inherited by the Indonesian nationalists after Independence in 1945. On the one hand, cultural diversity is a blessing for Southeast Asia's largest economy. Each culture offers something interesting and this is what attracts millions of foreign tourists to Indonesia every year (hence tourism is an important foreign exchange earner). For example, cultural relics such as the Borobudur and Prambanan in Central Java and Yogyakarta but also contemporary culture such as Balinese Hinduism are reasons to book a ticket to Indonesia. On the other hand, having a multitude of different beliefs (religions), traditions, ethnics and cultures also implies having difficulties in terms of governance. In fact, on various occasions there have been violent clashes between different groups within Indonesia that had their roots in ethnic or religious differences, events that undermined Indonesia's national motto. There also exists a high degree of inequality in Indonesia and this has also fed negative sentiments among part of the Indonesian population. For example, income distribution inequality (reflected by a high - and rising - Gini ratio). But among the so-called "Outer Regions" there also exists a feeling of resentment toward the dominating political and economic position of Java (Jakarta in particular). These emotions were reason why the Indonesian government was forced to usher in the era of decentralization in the post-Suharto period. This section discusses a number of important aspects regarding Indonesia's demographic composition. Topics that are discussed include Indonesia's population growth, age structure and urbanization. Each of these topics is linked to Indonesia's economic growth potential. The annual national population growth rate of Indonesia between 2000 and 2010 stood at an average of 1.49 percent. This growth was highest in the province of Papua (5.46 percent) and lowest in Central Java (0.37 percent). Family planning in Indonesia is coordinated by the National Family Planning Coordinating Board (NFPCB), a government institution. Under president Suharto an effective family planning program was initiated in 1968 and - up to the present - continued by his successors. This program is a key strategy with regard to the country's economic development as a low population growth rate translates into a higher per capita gross domestic product (GDP) which translates into higher incomes, higher savings, higher investments and implies a fall in the poverty rate among the population. The national population growth rate was 1.2 percent in 2015 according to data from the World Bank. Badan Pusat Statistik (BPS), the government's statistics agency only conducts thorough studies on the Indonesian population size once every decade. According to the latest study (2010) Indonesia had a total population of 237.6 million people. However, according to recent estimates (from various institutions) Indonesia is estimated to have more than 260 million inhabitants in 2017. The United Nations (UN) earlier stated that the population of Indonesia is estimated to exceed 270 million by 2025, exceed 285 million by 2035 and exceed 290 million by 2045. After 2050 the UN expects that the size of the Indonesian population starts to decline. The UN also projects that by 2050 two thirds of Indonesia’s population will live in urban areas. Over the last forty years the country has experienced a process of rapid urbanization, resulting in the current situation in which over half of Indonesia's total population resides in urban areas (see table below). For the economy this constitutes a positive development as urbanization and industrialization are necessary to grow into the ranks of a middle income country. The biggest cities of Indonesia are found on the island of Java. Here we find the capital city of Jakarta that had more than 10 million inhabitants according to the latest official census (2011 data). The unofficial figure is probably much higher. Moreover, every morning a huge amount of workers travel from the satellite cities toward Jakarta to do their jobs. In the afternoon or evening they travel back to the satellite cities around Jakarta. This massive daily inflow and outflow of people causes severe traffic congestion in Jakarta. After Jakarta, the biggest cities in Indonesia are Surabaya (East Java), Bandung (West Java), Bekasi (West Java), and Medan (North Sumatra). One important strength of Indonesia's demographic composition in relation to its economy is that the country has a young population. This young population implies a - potentially - large workforce (thus making it of vital importance that this workforce can be educated to obtain higher skills and can be absorbed by employment opportunities). Indonesia's total median age is 28.6 years (2016 estimate). This indicates that one half of the population is older than 28.6 years, while the other half is younger than this figure. When divided in sexes the female median age is one year older (29.1 years) as compared to the male counterpart (28.1 years). In 2010 around 19 percent of the Indonesian population was below ten years of age, around 37 percent was below twenty years of age, and around half of the population was below thirty years of age. Such numbers indicate that - from a demographic perspective - there is great potential for both productivity and creativity in Indonesia. A temper in population growth caused by decreases in fertility (which can be caused by matters such as better access to birth control, rising incomes, urbanization and higher levels of education for women) helps to stimulate a significant shift in the age distribution of the population towards those of the working age (but at a later stage decreases in mortality and fertility will cause an aging population). This shift is able to accelerate economic growth as the working age population increases while the (relative) number of dependent children declines. This process can be thought of as constituting a series of waves. The first wave begins when this working age population is employed which results in increased production. Employment also implies higher incomes and consequently causes households to consume more products. Households might also save more due to the reduced number of child dependents which subsequently leads to increased investment, as well as rising capital stock and further increases in economic production. The second demographic wave occurs when large portions of the population approach the end of their working lives and commence to save and invest for their retirement. Thus, the resulting increased capital accumulation may help to drive economic growth further. After this stage concern about the economy can arise because of stagnating population growth and an aging population. Currently Indonesia is positioned somewhere in the middle stage of that first wave. Both child mortality and fertility are declining quickly and the working age population is growing at a relatively fast rate while the total population is growing at a relatively slow rate. This has resulted in a large population group (around half of the total population, thus 125 million Indonesians) that is below the age of thirty years old, which -potentially- is productive and therefore can function as the engine of the national economy. Domestic consumption is a huge source of Indonesia's continuously strong GDP growth performance as household consumption accounts for more than 55 percent of total economic growth. The country's reliance on domestic consumption was actually one of the reasons why Indonesia weathered the global financial crisis of 2008-2009 relatively smooth with an average GDP growth of 5.6 percent in the years 2008-2010. Moreover, solid economic growth has resulted in an influx of Indonesians into the country's middle class. Annually, around seven million Indonesians join the ranks of this middle class according to a World Bank report released in 2012. However, after 2013 the depreciating rupiah (versus the US dollar) and higher interest rates (as well as low commodity prices amid sluggish global economic growth) have managed to somewhat undermine the strength of Indonesia's consumer force. A critical note, however, is that there are currently millions of (educated) unemployed Indonesians who cannot be absorbed by the Indonesian labor market. In fact, one characteristic of Indonesia is that the unemployment rate is highest for people between the age of 15 and 24, far above the country's national average. 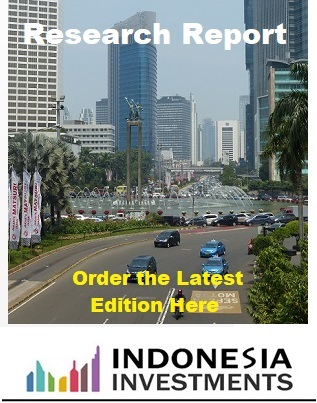 For a detailed overview of unemployment in Indonesia, visit our unemployment section. In terms of religion, Indonesia contains a clear Muslim-majority. Approximately 87.2 percent of the total Indonesian population - or 207.2 million individuals in absolute numbers - is Muslim. However, Indonesia is not an Islamic nation (only in the special region of Aceh on the northern tip of Sumatra Islamic Sharia law is being applied). But despite being a secular democracy, principles based on Islamic doctrine do play a large role in the politics, the economy and society of Indonesia. For example, if a restaurant serves halal food (food prepared in line with Islamic principles) it should see more customers and therefore most restaurants will put it on the menu. Another example is that it is very hard to imagine Indonesia having a non-Muslim president. There are also some 16.5 million Protestants (6.9 percent of the total population), 6.9 million Catholics (2.9 percent of the population), and 4 million Hindus (1.7 percent) living in Indonesia. Lastly, there exist small minorities of Buddhists as well as those who practice Confucianism, mostly members of the ethnic Chinese community. Contrary to many countries in the West, for many Indonesians religion is still a big part of their identities. 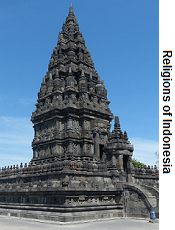 For more information on this topic, visit our Religions of Indonesia section. 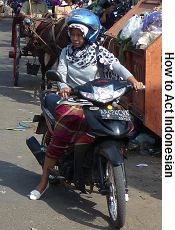 • How to Act Indonesian?